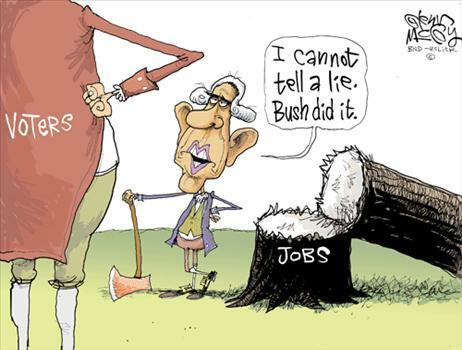 ”America elected you on a promise of hope and change. We trusted you. So we elected you. We regret it. So in 2010…. You Will Lose Big. No more taxes. No more spending. No more socialism. We tried to warn you. But you wouldn’t listen. So now you will pay.We’re taking our country back. From radical leftists and liberals. We’re coming after you. America Rising Part 2- A Call for the Republican Party to Join! “The American Federation of State, County and Municipal Employees is now the biggest outside spender of the 2010 elections, thanks to an 11th-hour effort to boost Democrats that has vaulted the public-sector union ahead of the U.S. Chamber of Commerce, the AFL-CIO and a flock of new Republican groups in campaign spending. The 1.6 million-member AFSCME is spending a total of $87.5 million on the elections after tapping into a $16 million emergency account to help fortify the Democrats’ hold on Congress. Last week, AFSCME dug deeper, taking out a $2 million loan to fund its push. The group is spending money on television advertisements, phone calls, campaign mailings and other political efforts, helped by a Supreme Court decision that loosened restrictions on campaign spending. A recent Gallup poll piled on bad news for President Obama. At the beginning of 2010 the president enjoyed support from 69% of Hispanics. By May that number was down to 57%. Now just 55% of Hispanics support the president and his liberal agenda. But what’s going on behind the numbers could possibly be a harbinger of doom for Obama’s re-election in 2012. Across the country conservative Latino organizations are springing up as fast as illegal immigrants are streaming across the border. And these organizations are not content to just conduct meetings and complain about the liberal takeover in Washington. Some are taking action. In Dallas, Amigos de Patriots is launching an online and TV ad campaign called “Vote your Values, Vote Conservative.” The idea is to remind Hispanics that their ancestors fled countries where prosperity was killed by left-wing regimes. The 30-second spots also take on social issues like abortion, a practice that is dear to liberals and Democrats but that the Latino community at large finds offensive. “In 2006, 17 categories favored Democrats, which helped them take control of the House and Senate from Republicans. Democrats picked up six Senate seats and 30 House seats. In the Pew Poll, 23 of the 28 categories of voters now favor Republicans. What’s more, 22 of the 28 categories support the GOP by 49 percent or more. There are only four categories of voters that are under 40 percent: those making less than $30,000 a year, at 39 percent; voters who are unaffiliated with a religion, at 37 percent; black voters, at 10 percent; and Democrats, at 8 percent. What is most remarkable is how far some categories have swung away from Democrats and toward the GOP. Democrats have lost a significant advantage with women voters, who supported Democrats by a 48 to 41 percent margin in 2006, but who have now flipped to supporting the GOP by 49 to 43 percent. Voters over 65 years old were for Democrats by a 48 to 42 percent margin four years ago. They now favor Republicans by 52 to 38 percent. That’s a 20 point swing. Perhaps most damaging for Democrats, they have suffered huge losses among Independents. 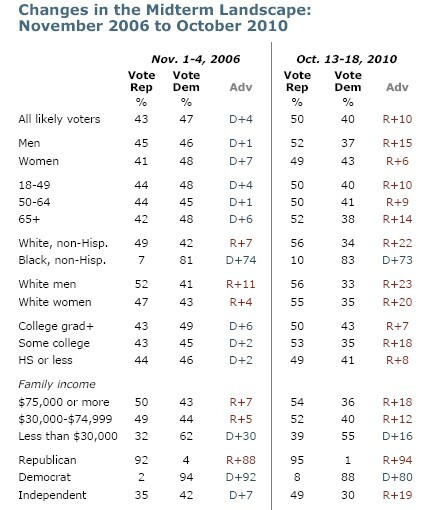 Democrats were up 7 points in 2006, by 42 to 35 percent. They now are down 19 points, 49 to 30 percent. That’s a 26-point swing. Tea Party to the Rescue How the GOP was saved from Bush and the establishment. ”The first: the tea party is not a ”threat” to the Republican Party, the tea party saved the Republican Party. In a broad sense, the tea party rescued it from being the fat, unhappy, querulous creature it had become, a party that didn’t remember anymore why it existed, or what its historical purpose was. The tea party, with its energy and earnestness, restored the GOP to itself. Because of this, because they did not go third-party, Nov. 2 is not going to be a disaster for the Republicans, but a triumph. The tea party did something the Republican establishment was incapable of doing: It got the party out from under George W. Bush. The tea party rejected his administration’s spending, overreach and immigration proposals, among other items, and has become only too willing to say so. In doing this, the tea party allowed the Republican establishment itself to get out from under Mr. Bush: ”We had to, boss, it was a political necessity!” They released the GOP establishment from its shame cringe.